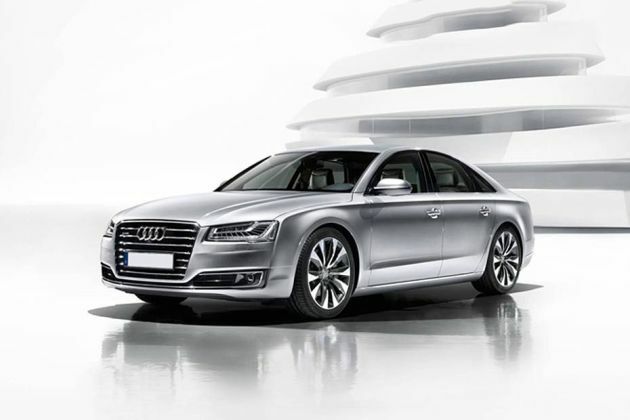 Audi India, one of the most popular luxury car maker has officially introduced the facelifted version of Audi A8 with improved cosmetics and wheelbase. Now, this refurbished version is available in three variants among which, the Audi A8 L 4.0 TFSI Quattro is the only petrol version. This latest trim gets a refurbished radiator grille, a sleeker bumper and a restructured taillight cluster. In addition to these, the auto maker is offering Matrix LED headlamps as an optional feature. The interesting aspect about the exteriors is that the manufacturer is offering this model series with over a 100 body paint options. On the other hand, it also comes with updated interiors along with a choice to choose between 23 interior colors and 13 wooden inserts, which makes it unique in its segment. Powering this trim is the 4.0-litre TSFI petrol motor that is capable of generating 429.12bhp, while churning out a mammoth 600Nm torque, which is impressive. As a result of modification, this TSFI engine is now capable of producing 13.88 Kmpl, which is quite good considering its caliber. On the hand, this luxury trim is blessed with sophisticated aspects including Bose sound system, MMI navigation, yacht shaped leather wrapped gear shift lever and several other features. The appearance of this 2014 version is fabulous with great build quality along with a new set of cosmetics. This latest version gets a redesigned single frame radiator grille that is treated with a lot of chrome. The headlight cluster gets a minor tweak and it is incorporated with bi-xenon headlamps. However, the car maker is also offering Matrix LED headlamps as an optional feature. This lights comprise of 25 individual light emitting diodes that can be switched off and on or dimmed individually as required, which gives out a unique illumination configuration. The bonnet is also updated with new expressive lines, which compliments the new headlight cluster. On the other hand, the bumper is also refurbished and it includes a single unit air dam that comes with a chrome surround, which further accentuates the front facade. The car maker has also made a slight modification to the rear profile with a newly sculptured boot lid that is embossed with a lot of chrome inserts. The taillight cluster too gets a minor update, which makes it sleeker and brighter. The bumper remains to be same, but it is now fitted with a pair of newly structured exhaust pipes that gives a distinct look to the rear. The company has given a minor update to the side profile, but it still looks elegant. The all new Audi A8 L 4.0 TFSI Quattro gets a slightly modified interiors with improved quality. The major aspect about the interiors is its improved leg space as the company has increased the wheelbase to 3122mm. On the other hand, this trim is also available with an exclusive package, which includes seat belts, leather steering wheel, control elements in exclusive leather, yacht shaped wooden gear shift lever and numerous other aspects. The cockpit section is fitted with a sleekly structured dashboard that is incorporated with a 4-spoke leather wrapped steering wheel accompanied with gear shift paddles. The best part about the front cabin is its sophisticated central console that has a glossy finish and is equipped with numerous advanced equipments including AC unit, infotainment system and a gearbox console. All the seats are electrically adjustable with memory function, wherein the front seats can be move forward, which will further increase the leg space for rear occupants. This variant is fitted with an advanced 4.0-litre petrol power plant that is incorporated with a bi-turbocharger in combination with FSI technology. It has 8-cylinders, 32-valves that displaces 3993cc and it comes integrated with Audi Valvelift system . It has the ability to churn out a commanding power of 429.19bhp between 5100 to 6000rpm along with a peak torque 600Nm in the range of 1500 to 5000rpm, which enables the vehicle to reach 100 Kmph mark in just 4.6 seconds. The torque output is transmitted to all the four wheels with the help of a Quattro permanent all wheel drive system. This engine is coupled with an 8-speed tiptronic automatic gearbox that helps the motor to deliver a flawless performance and to reach a top speed of 250 Kmph. This 2014 version is incorporated with an advanced adaptive air suspension system that works in combination with Audi drive select system. This enables the vehicle to adapt itself according to the road conditions without compromising in terms of stability and driving comforts. The car maker has equipped ventilated disc brakes to all the four wheels of this trim and accompanied them with high performance brake calipers. This proficient braking mechanism is boosted by the advanced anti lock braking system with electronic brake force distribution and brake assist system. Furthermore, it is also integrated with electronic stabilization program, anti slip regulation and other traction control program, which makes handling simpler. This Audi A8 L 4.0 TFSI Quattro trim is available with quite a number of top rated features. It comes incorporated with features like a four zone deluxe automatic AC unit, an advanced Audi parking system with rear view camera, comfort front center armrest, electrically adjustable seats with memory function, energy recovery system, power assisted closing for doors, cruise control system, central locking with remote control and key less entry. It is also available with an advanced infotainment unit featuring Bose sound system along with Audi music interface, radio, Bluetooth connectivity and MMI touch panel. This latest trim is available with night vision assistance as an optional feature, which will improve the road safety at night times. On the other hand, it comes with standard features like tyre pressure monitoring system, full size airbags, first aid kit with warning triangle, anti-theft alarm with tow away protection, anti-theft wheel bolts, and a space-saving spare wheel. 1. Engine is powerful, fuel efficient and perkier as well. 2. Increased wheelbase, exterior changes adds to its classiness. 1. Matrix headlamps can be offered as a standard feature. 2. Cost of maintenance and spares is high.